Ever have one of those spells where it feels like you just can’t prepare a meal that will make everyone happy? Lately, one of us in particular — not saying any names because I don’t want to throw my only son under the bus (but this phase better end soon!) — has been complaining a lot: “Just to tell you mom…this isn’t my favorite.” So, while the kid is polite, it would be nice to hear a positive comment once in awhile. Last night, I was successful. 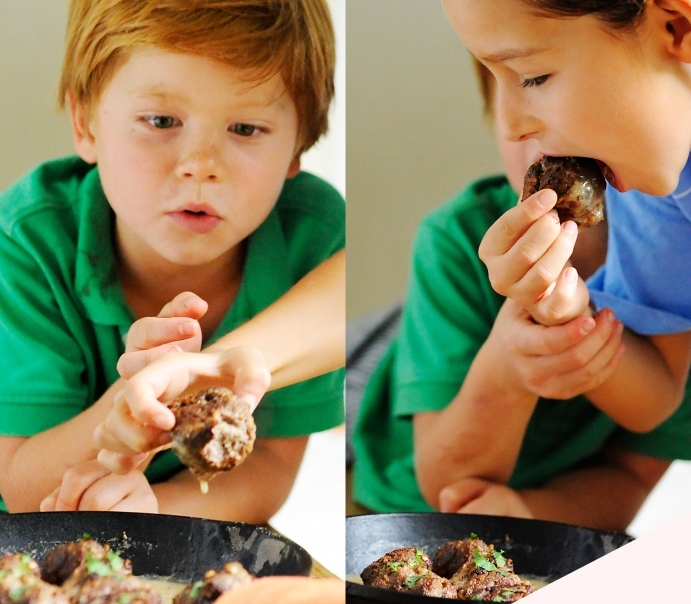 He tasted these meatballs and said, “These are amazing! 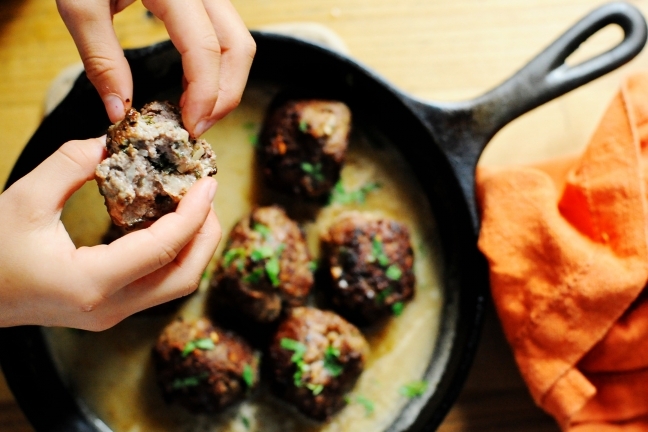 Even better than IKEA meatballs!” Wait… what?! So apparently he had a sample meatball when the family went to IKEA this weekend while I was working. I’m not sure that is a compliment, but I’ll take it because everyone was happy last night, me included. These are definitely a new staple for us. Lots of flavor, but no crazy spices that might offend one of your more picky eaters. I have to admit, I’ve never had “Swedish meatballs” so the flavor might not be 100 percent authentic, but they were still really good! I mainly called them “Swedish meatballs” because of Tate’s IKEA point of reference. I made enough so we would have leftovers (about four meatballs) so if you have a family smaller than four or don’t want leftovers, you might want to half the recipe. You see his death grip on her arm? Heat oven to 350 degrees. Mix all the meatball ingredients together in a large mixing bowl. Then, with your hands, mush it all together until well combined. Form meatballs about 2 inches in diameter. Heat a cast iron skillet or pan on high. Cook meatballs and let them get brown on one side, and then flip (about 4 min on each). Continue to turn the meatballs on the raw sides so they get brown all over. Then cook on 350 for 15 or so minutes. My pan was small so I could only fit half so if your pan is small or you don’t have a oven safe pan, transfer the meatballs to a glass dish or baking sheet. While that is cooking, keep the grease in the pan and add the chicken broth and almond milk. While that is heating on medium high heat, stir the arrowroot powder and water in a small bowl. Once combined well, stir that in with the rest of the gravy. Add a dash of salt and pepper and allow to come to a boil. Then reduce and let cook for a couple more minutes until it thickens. When the meatballs are done, place them on a plate (or back into the gravy pan) and cover with gravy. Garnish with parsley and enjoy! 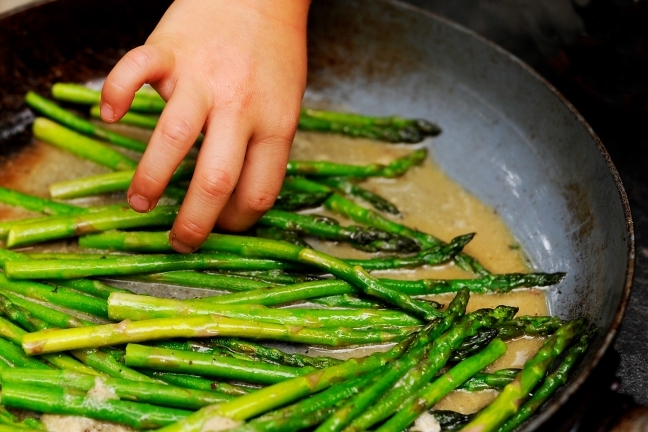 Oh and we sautéed the asparagus in some ghee and then poured in the extra gravy. It was so good!